Brown coat is on!! Little garage is lookin' GREAT! This ‘little’ garage project of Mister’s has zipped right along!! It is amazing the amount of work that has been accomplished in just a few weeks’ time. Mister is one happy camper, and this morning he was saying that he thinks this might be done by Christmas… It will by a great present (that he gave to himself…LOL). The last post I wrote about had pictures of the garages framed, partially sheathed and the trusses were up. We expected that the sheathing would cover the entire framing, but they only used it for the sheer walls. Within the last three weeks they’ve finshed the roofs, put the black paper and styrofoam all around the walls, and got the [chicken] wire up for the stucco. 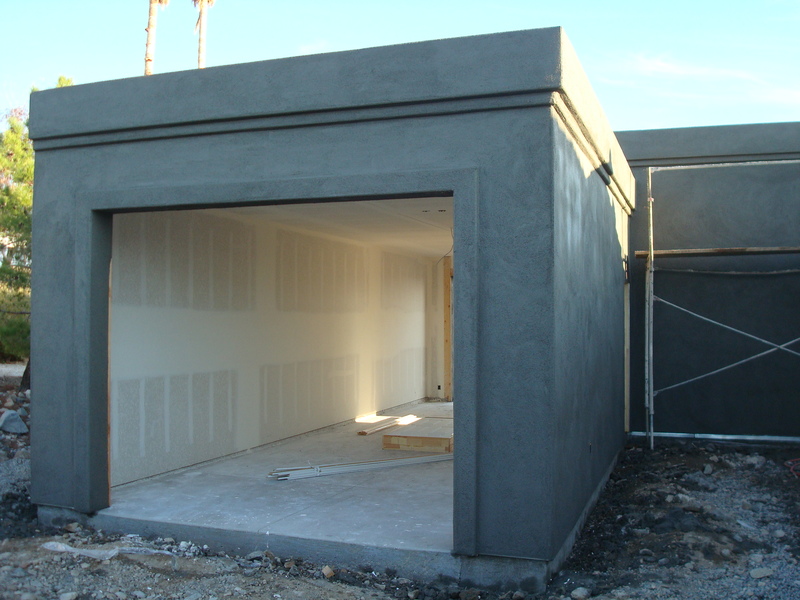 The stucco guys told us our house had special rounded corners, so they did extra wiring around all the garage corners… which made for a really nice look. Last week was a super busy one. Monday the walls were insulated. Tuesday and Wednesday the drywalling was was done. The mud and taping was done every day Thursday through Sunday. Today we woke up to find two crews here. One who did the texture, and the other who started the brown coat for the stucco. It looks AWESOME!!!! Do you think you’re better than me?! I love the brown look! LOL. It will end up matching the WHITE house when they finish it off. It is so close! It looks wonderful and you must be so excited! Maybe you should paint the house? Not exactly a cool color for summertime, but I love the brown rich earthy look! Sorry, the “brown rich earthy look” has already started to disappear. It turns into a dull grey once it is fully dry. Not a lot of hope to keep it wet here for long.